Clergyman Henry C. McCook wrote this hymn in honor of President Lincoln. As noted in the passage below the hymn, McCook wrote the text the day following Lincoln's assassination. 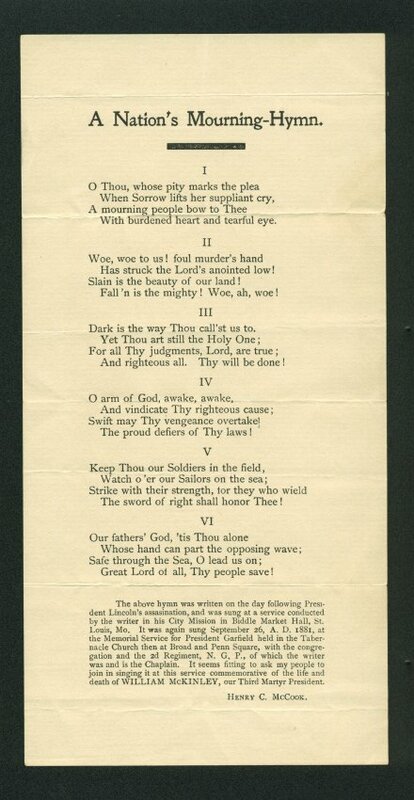 McCook's congregation, located in St. Louis, Missouri, sang this hymn during their service dedicated to the President. With burdened heart and tearful eye. Has struck the Lord’s anointed low! Slain is the beauty of our land! Fall’n is the mighty! Woe, ah, woe! Dark is the way Thou call’st us to. And righteous all. They will be done! The proud defiers of Thy law! The sword of right shall honor Thee! Great Lord of all, Thy people save! The above hymn was written on the day following President Lincoln’s assassination, and was sung at a service conducted by the writer in his City Mission in Biddle Market Hall, St. Louis, Mo. It was again sung September 26, A.D. 1881, at the Memorial Service for President Garfield held in the Tabernacle Church then at Broad and Penn Square, with the congregation and the 2d Regiment, N.G.O., of which the writer was and is the Chaplain. It seems fitting to ask my people to join in singing at this service commemorative of the life and death of WILLIAM McKINLEY, our Third Martyr President.